KIEV, Ukraine -- Ukraine’s two largest opposition parties – Fatherland, which is headed by the imprisoned former Prime Minister Yulia Tymoshenko, and the Front of Change (FZ) whose leader is the former parliamentary speaker and former foreign minister, Arseny Yatsenyuk – have agreed to join forces for the October 28 parliamentary election. Front of Change (FZ) leader, Arseny Yatsenyuk. This may be the beginning of a united opposition capable of defeating President Viktor Yanukovych’s Party of Regions (PRU) in the fight for power. But this may also be the start of a fierce fight for leadership inside the opposition between Yatsenyuk and Tymoshenko’s team. Two smaller, but no less ambitious opposition forces, Punch and Freedom, have chosen to stay outside the process, at least for the time being. Recent polls show that this may be the right strategy. Fatherland, FZ and the less popular opposition parties, People’s Movement, Reforms and Order, People’s Self-Defense and For Ukraine, announced on April 23 that they agreed to form a united opposition. 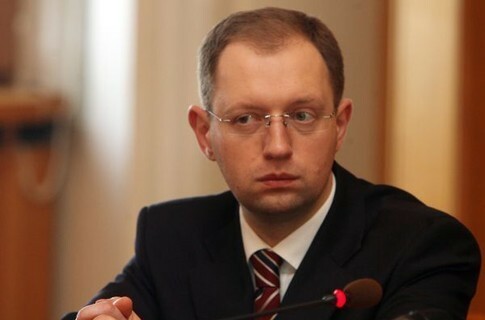 The six will compile a joint list for the election, which will be headed by the leaders of the two most popular among them, Tymoshenko and Yatsenyuk. The parties will also back joint candidates in the first-past-the-post constituencies. Yatsenyuk told a press conference that the joint lists of candidates from the opposition alliance would be compiled by the legal deadline of July 29. Yatsenyuk said this might be the beginning of a process to set up a single strong opposition party. He also said the alliance would back Punch leader, the heavyweight boxing champion Vitaly Klichko, in the Kiev mayoral election. The PRU has been skeptical of the opposition alliance’s viability. The leader of the PRU faction in parliament, Oleksandr Yefremov, has predicted that the alliance would break up after the election like it happened to many other broad alliances in Ukraine’s parliament in the past. Tymoshenko said in an interview with the weekly Zerkalo Nedeli, which was published on April 20, that the six parties’ unification was not enough. She opined that Punch’s and Freedom’s decisions to go it alone were the most serious threats to opposition unity. She warned that the votes cast for the two parties might be stolen during vote count as it would be difficult for a disunited opposition to watch the process in electoral commissions across Ukraine. Like Yatsenyuk, Tymoshenko promised support for Klichko in the Kiev mayoral election. Apparently the alliance will support Klichko in Kiev with a caveat that Punch will join the alliance. However, Klichko remains adamant: his people will cooperate with other opposition parties during the election process and once elected to parliament, but Punch will not join the alliance. Klichko, citing sociological studies, argues that Punch will score more votes if campaigning on its own. According to a study cited by Klichko in a recent interview, FZ would score 10 percent and Punch 7 percent, but a FZ-Punch alliance would score 13 percent. He claimed that this argument was valid also for other major opposition parties so unification would produce no synergy effect. Klichko’s argument about numbers and synergy has been born out by recent opinion polls held by the Kiev-based Razumkov think-tank. According to the freshest poll, which was held across Ukraine on April 14-19, in an election from party lists 19.6 percent of Ukrainians would vote for a joint Fatherland-FZ list and 16.6 percent would vote for the PRU, trailed by Punch with 8.5 percent. Razumkov’s poll, conducted two weeks earlier, had shown that Fatherland and FZ would hardly have scored fewer votes if campaigning separately, namely 23.0 percent (13.5 percent and 9.5 percent, respectively) against 19.5 percent for the Regions. This means that if there is no massive election fraud, which is feared by many, opposition unification is unlikely to influence the election outcome. However, it will be difficult for the opposition to muster a majority in parliament in any case as Ukraine’s election system and political culture has its peculiarities. Ukraine will have a new mixed system this October where half of the people’s deputies will be elected according to a proportional system from party lists with a 5 percent threshold, and the other half will be elected from first-past-the-post constituencies. PRU people and their allies are expected to defeat the opposition in the first-past-the-post elections where money and connections are likely to play an important role. Furthermore, once in parliament nothing should prevent current opposition candidates from switching camps like it happened in 2010 when a pro-government majority was formed in parliament within months after Yanukovych’s election as president. Interestingly, Yatsenyuk had shared Klichko’s point of view prior to Tymoshenko’s seven-year prison indictment last October, arguing that two opposition parties would “always” get more seats in parliament than one. Like Klichko, ambitious Yatsenyuk apparently feared that Fatherland could annihilate his party and relegate him to a secondary role if the two joined forces. Tymoshenko’s imprisonment, at least in theory, opened to Yatsenyuk (currently the second most popular opposition politician) the prospect of becoming the leader of a united opposition, sidelining Tymoshenko. If this is his goal, the opposition is as far from real unification as before the alliance agreement.